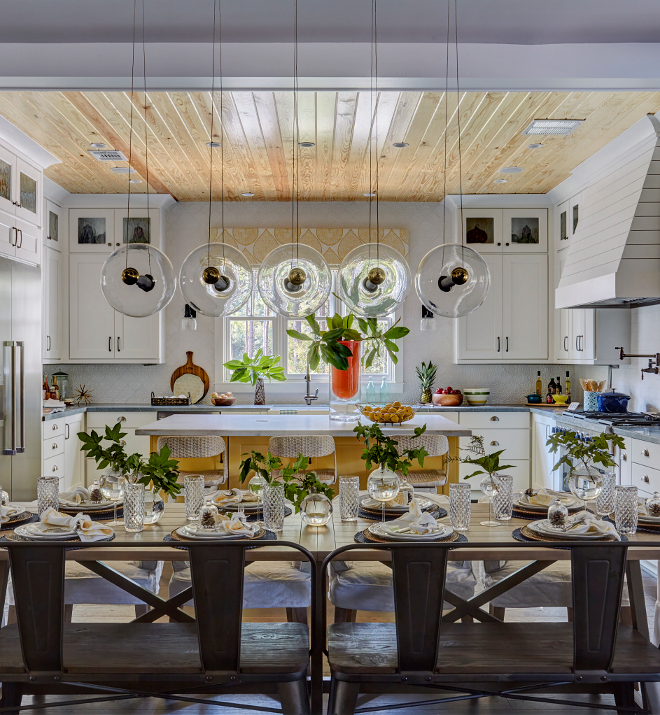 Morning Star Builder’s 2017 Southern Living Showcase Home is located in the first Tiger Wood’s designed golf course community, Bluejack National, in Montgomery, TX. 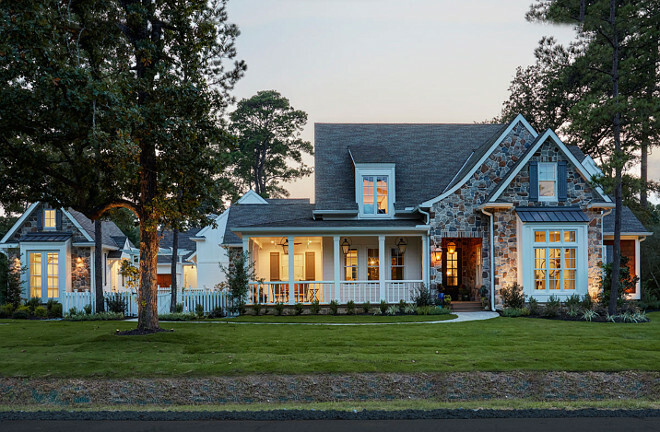 The Southern Living House Plan, Elberton Way, was modified for optimal Texas living in the Houston market and to take advantage of the views of the second fairway of the golf course. 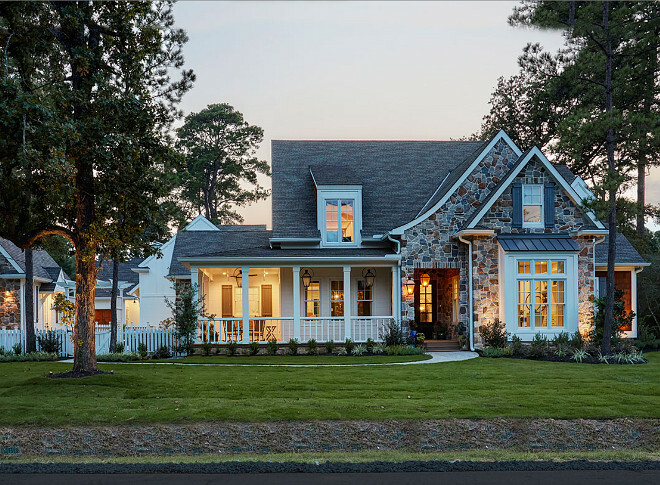 The enhancements of this popular Southern Living plan make for a truly unique, custom home. 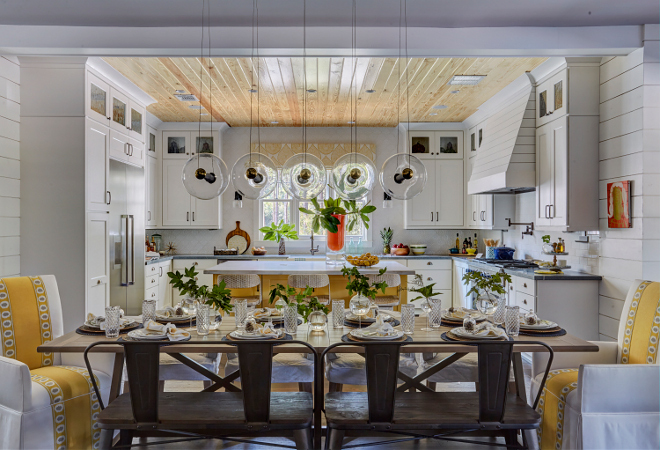 This home incorporates many of today’s popular design trends, including the service kitchen (also known as, a catering kitchen or super pantry), an attached guest casita, a spacious outdoor living area, and of course, shiplap! Lots of shiplap! 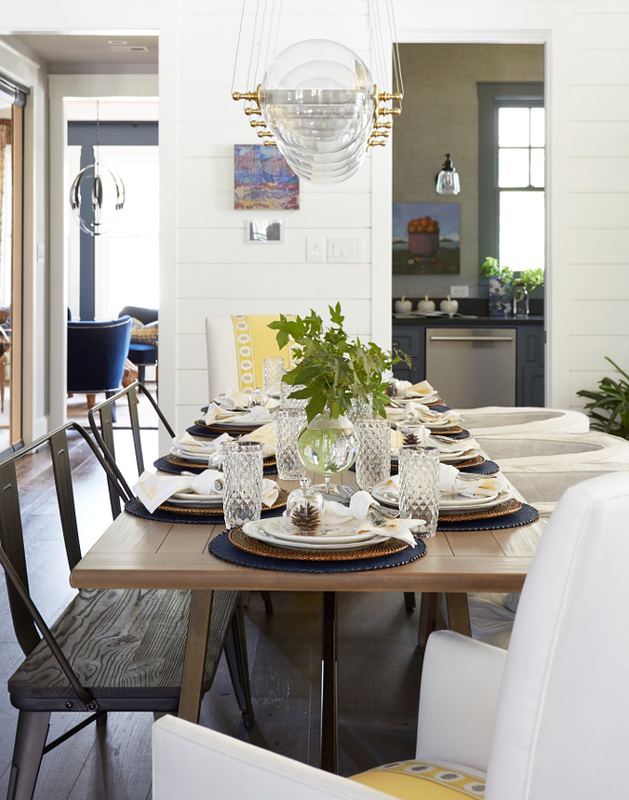 From top to bottom, this home speaks to all that is “Southern Living”. Isn’t this home extraordinary? The tour is every Friday, Saturday, and Sunday from 11:00 am to 5:00 pm through October 29th 2017! 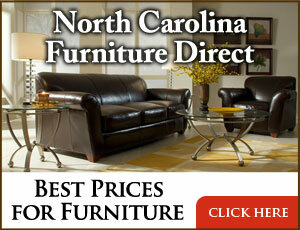 You can click here for more information! Siding Paint Color: Sherwin Williams SW 7551 Greek Villa. 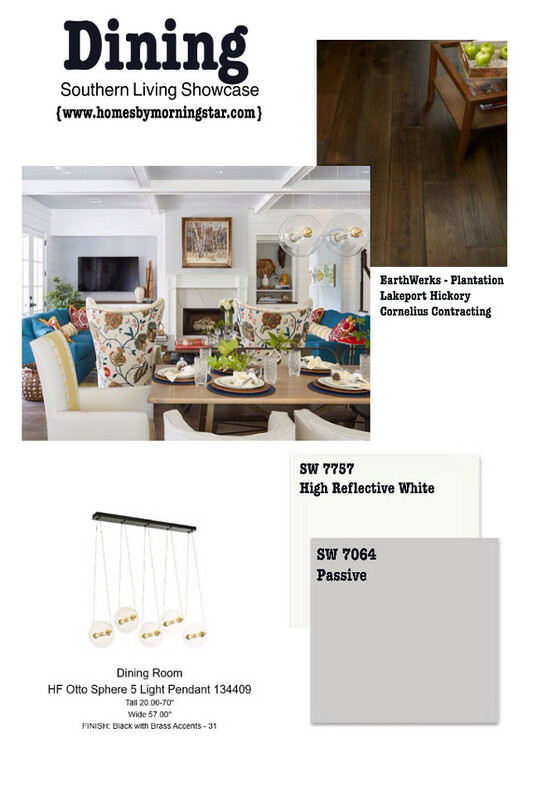 Shutters: Sherwin Williams SW 6257 Gibraltar. Home Specs: Main House: 5,130 sq. ft.
Total Living: 5,817 sq. ft. 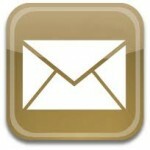 Covered Porches – 1,138 sq. ft. 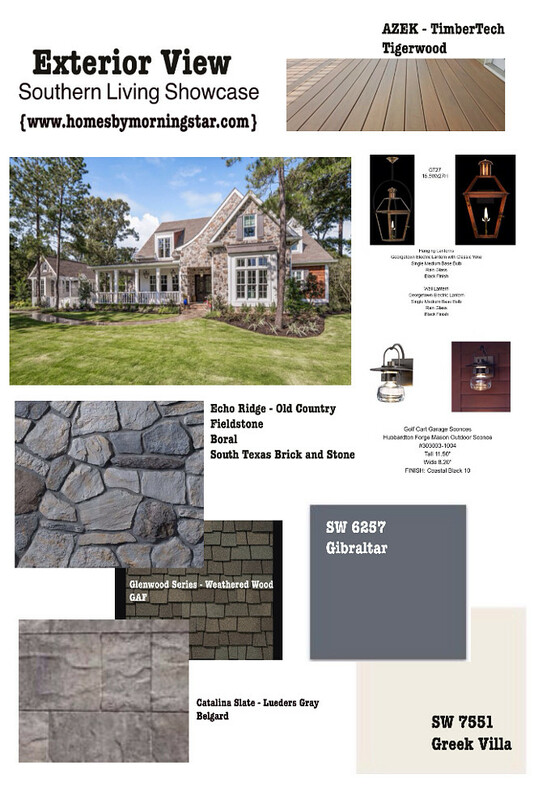 Exterior Stone: Echo Ridge – Old Country Fieldstone. 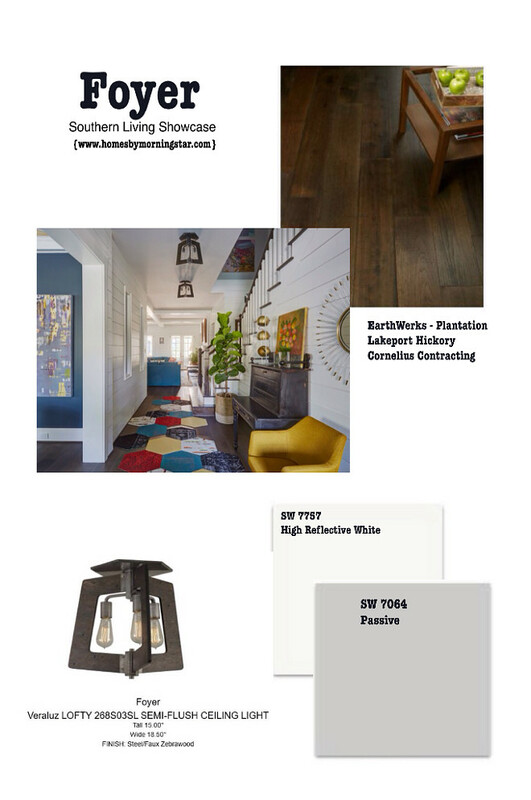 Porch Flooring: Azek Timbertech – Tigerwood. (Exterior photo by Brian Austin). This foyer is full of incredible ideas. 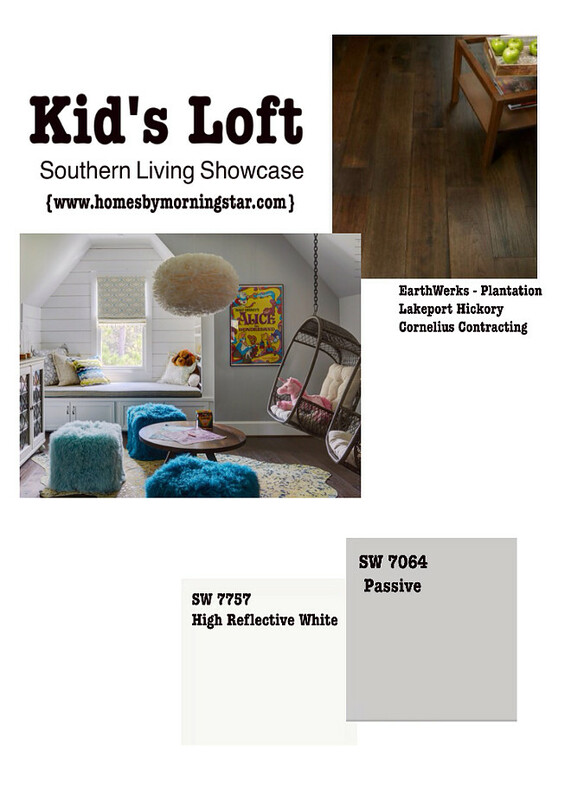 The dark hardwood floors beautifully contrast against the crisp white shiplap walls. 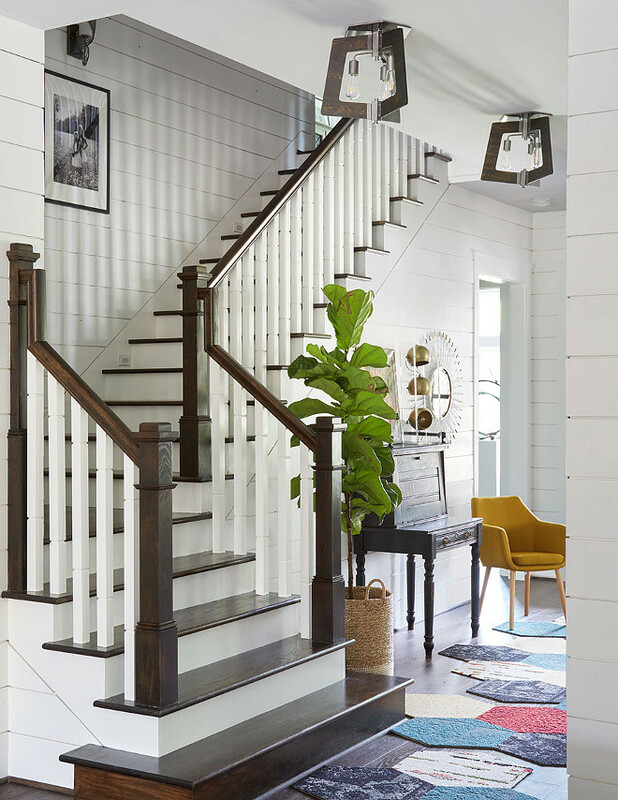 Shiplap paint color is Sherwin Williams SW 7757 Reflective White. 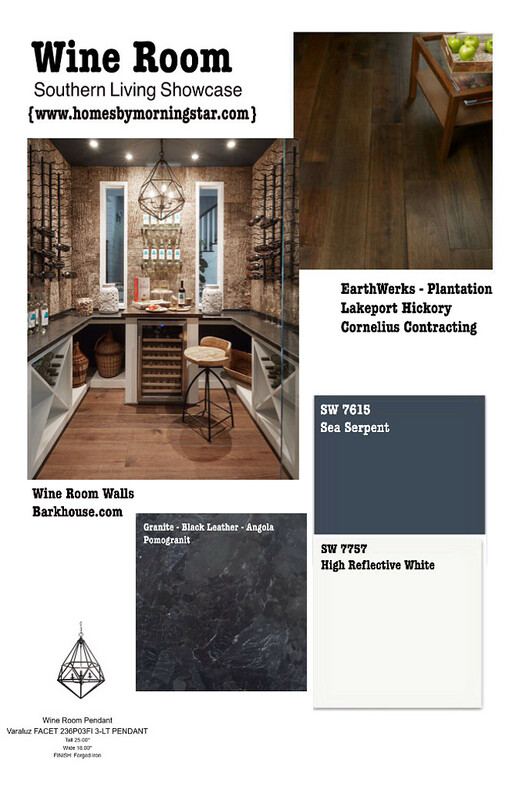 Hardwood flooring throughout the house is Earthwerks – Plantation Lakeport Hickory Cornelius Contracting (similar can be found here). 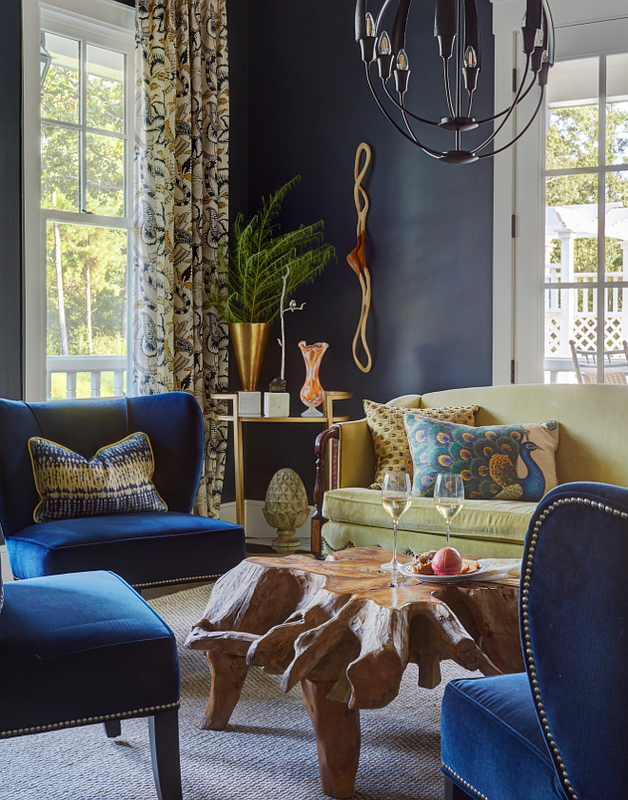 I love the energy of this living room! Aren’t these chairs gorgeous? The living room chairs are from Ambella. The back embroidery fabric is from Kravet and the seats are Tibetan fur. 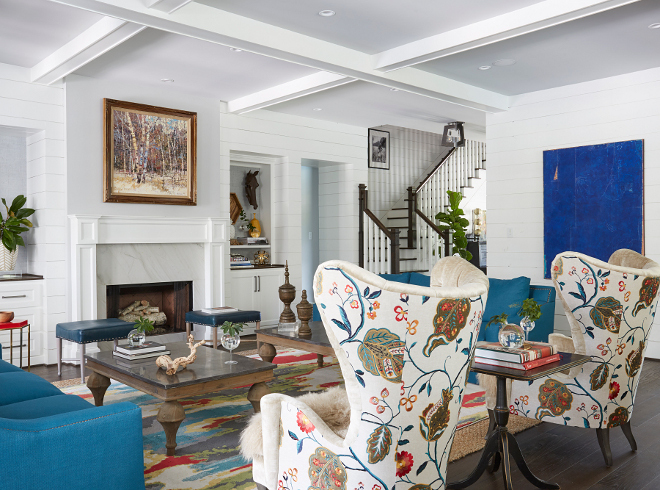 Interiors are by Chairma Design Group, Houston, TX. 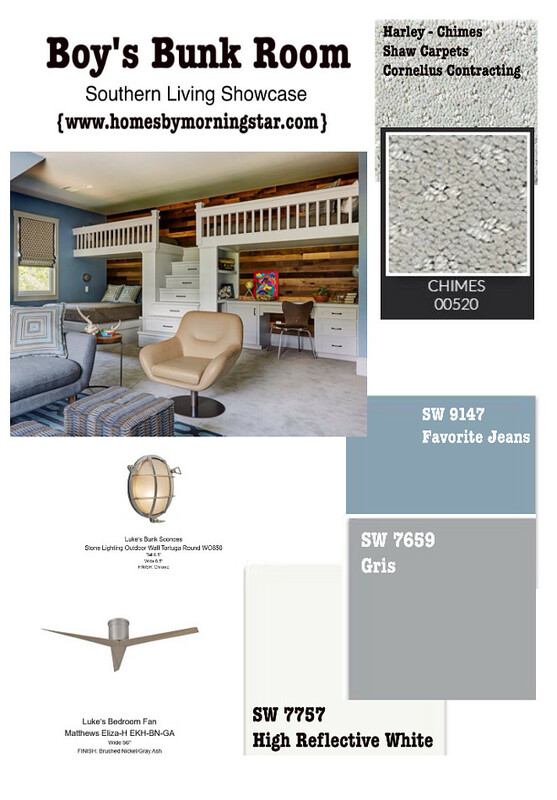 Ceiling paint color is a light grey by Sherwin Williams, Passive SW 7064. Sonces: Currey & Co. Beckmore. 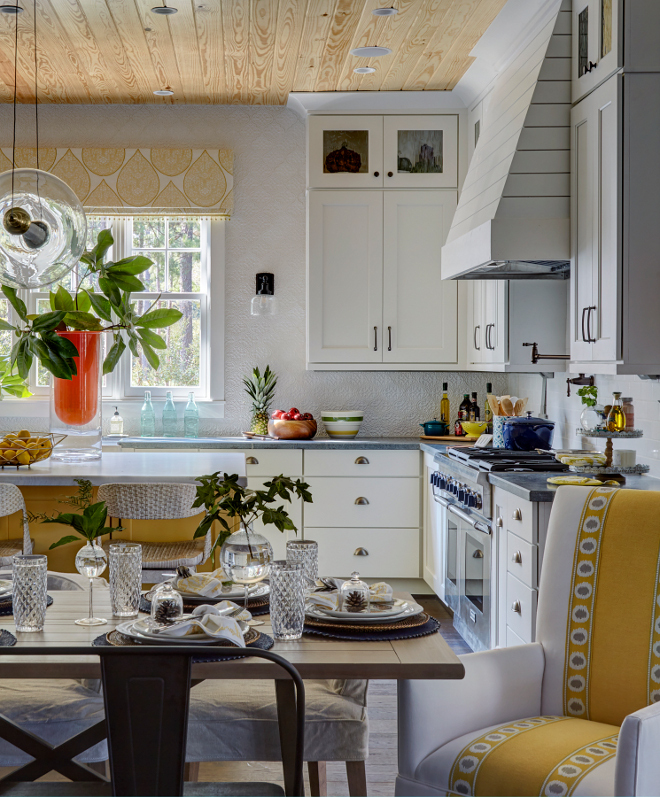 This kitchen is full of happiness and sunshine! 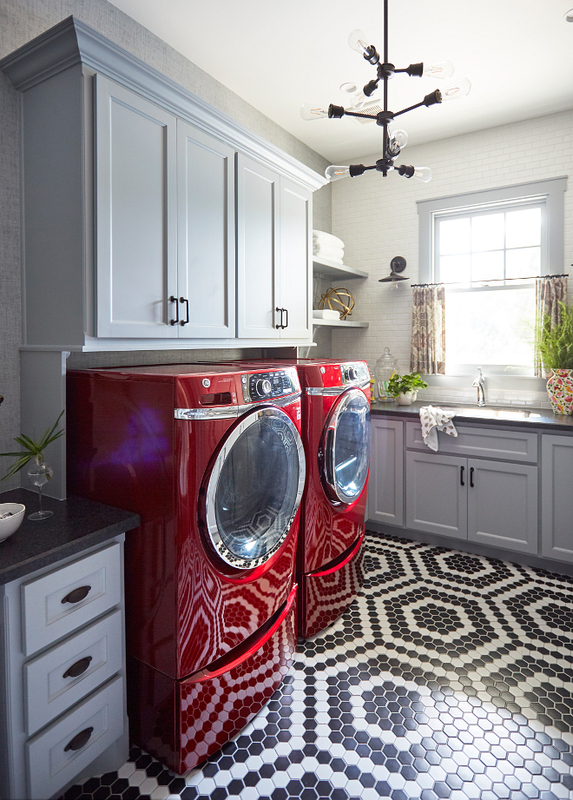 You can’t help but feel happy in this space! 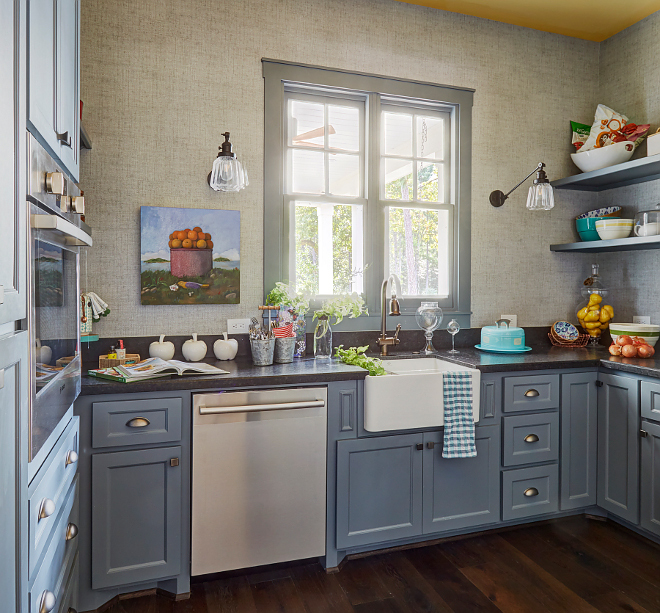 Cabinets: Wellborn – Full Overlay, Maple, Shaker Door. Benjamin Moore Yellow Paint Color: “Benjamin Moore Sunshine”. Cabinet Hardware: Drawer Pulls – Amerock – BP53010 cup – antique silver. Pulls – Jeffrey Alexander – antique silver. Kitchen Faucet: DXV DD35402300110 Victorian Pull Down Kitchen Faucet (similar faucet can be found here). 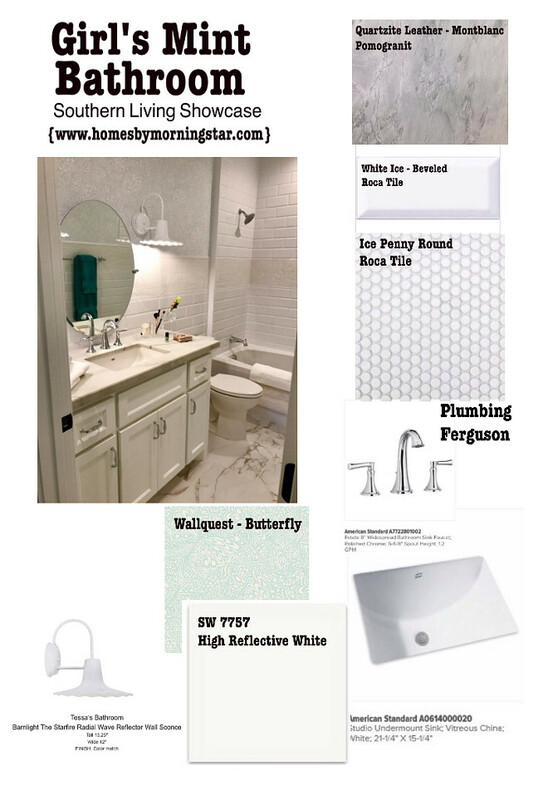 Sherwin Williams White Kitchen Cabinet Paint Color: “Sherwin Williams Reflective White SW 7757”. 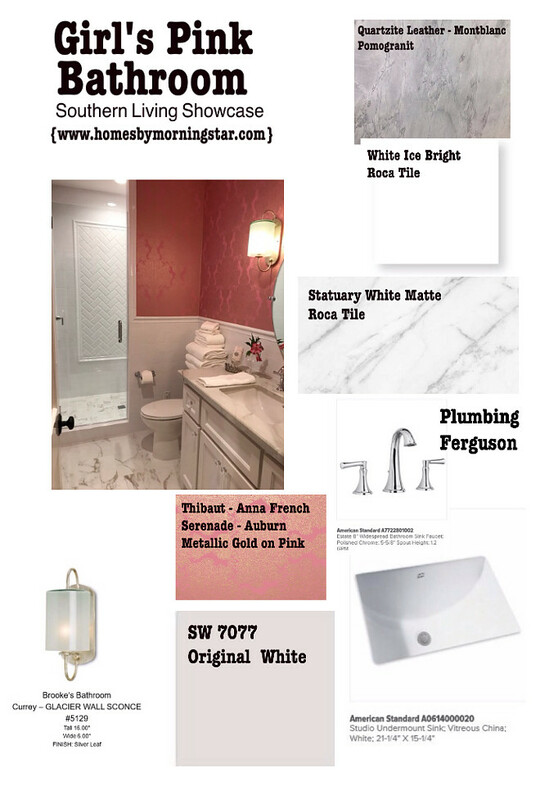 Backsplash: Arabesque- White Materials Marketing, Retro Classic- Lily Thorntree. Countertops: Soapstone- Barroca by Pomogranit (Perimeter), Quartzite Leather Montblanc by Pomogranit (Island). 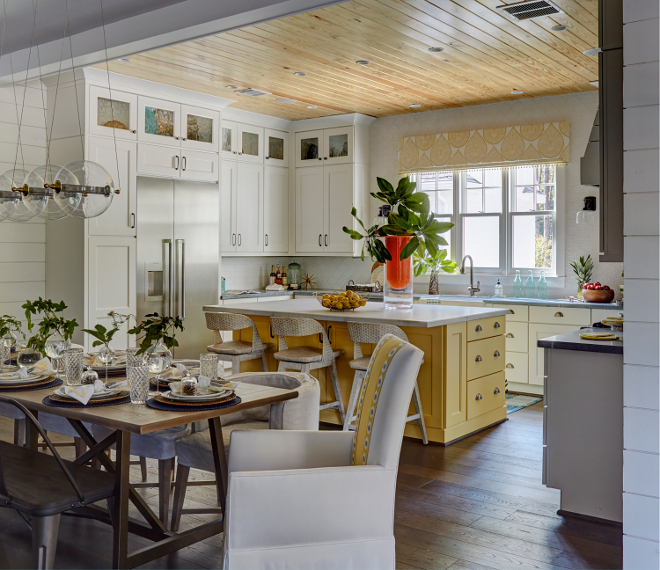 The kitchen opens to this spacious dining area. 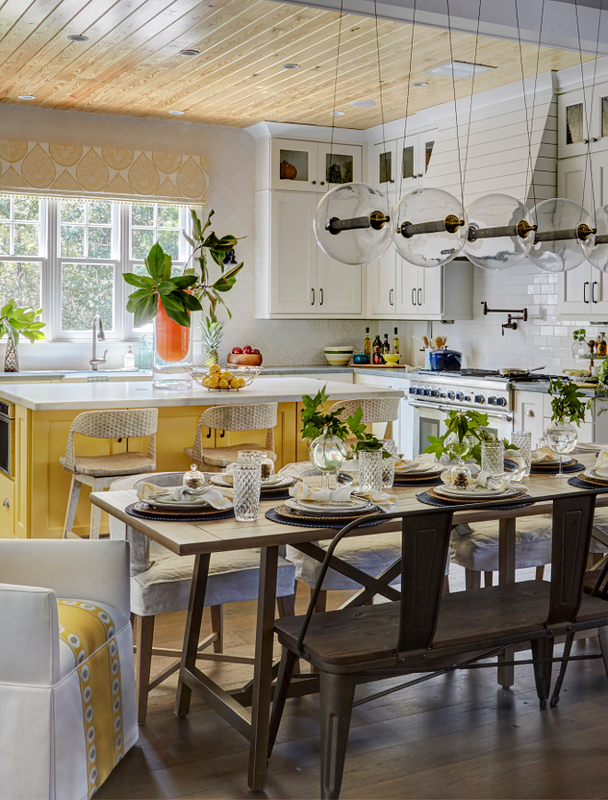 While elegant, this kitchen feels warm and inviting. I truly love the mix of elements found in this space. 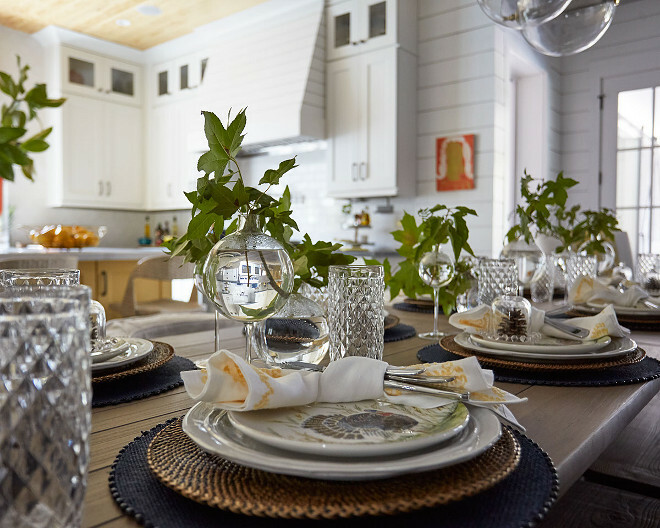 Similar dining table can be found here. Pot Filler (Above Range): can be found here. Farmhouse Sink: DXV Farmhouse sink (similar here). Lighting: Innovations Lighting Salem Wall Mount. 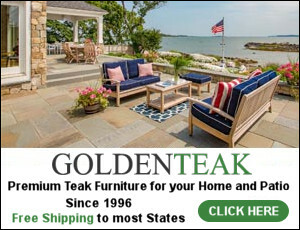 Similar metal benches can be found here. Lighting is Hubbardton Forge Otto Sphere 5 Light Pendant. This is statement lighting looks like! 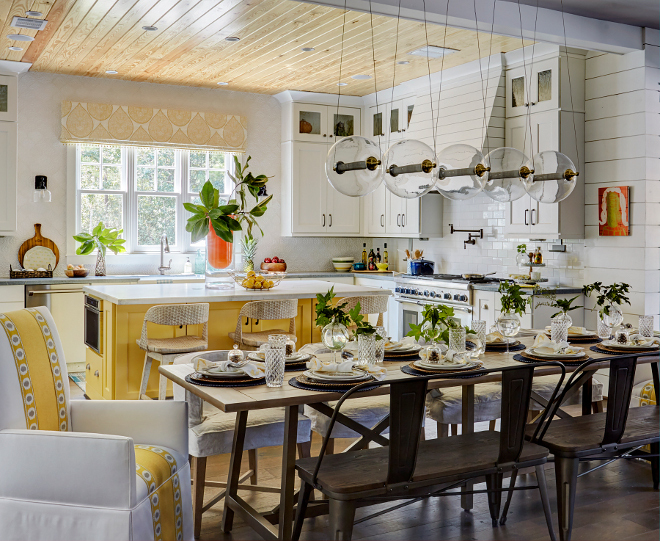 The dining area opens to a “service kitchen” on the right. The table decor is kept simple yet elegant. Navy placemat can be found here. Similar raffia placemat can be found here. 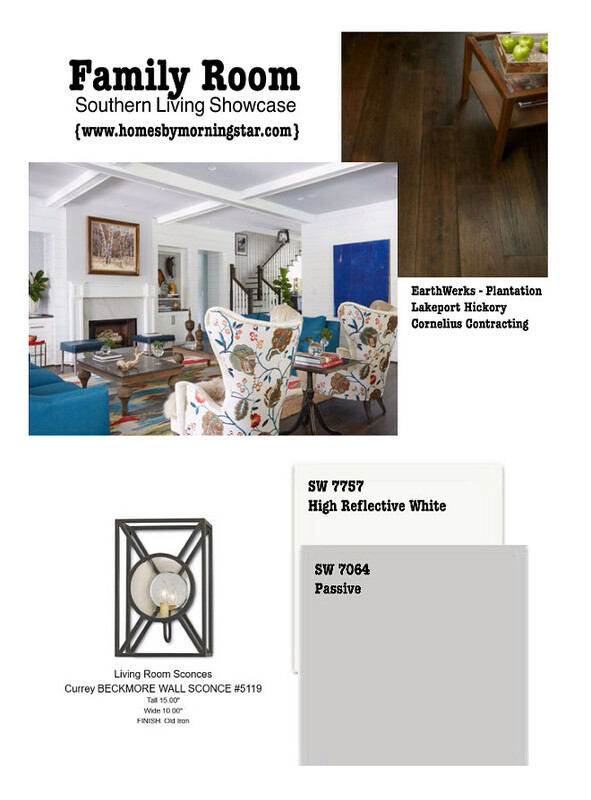 Shiplap paint color is SW 7757. 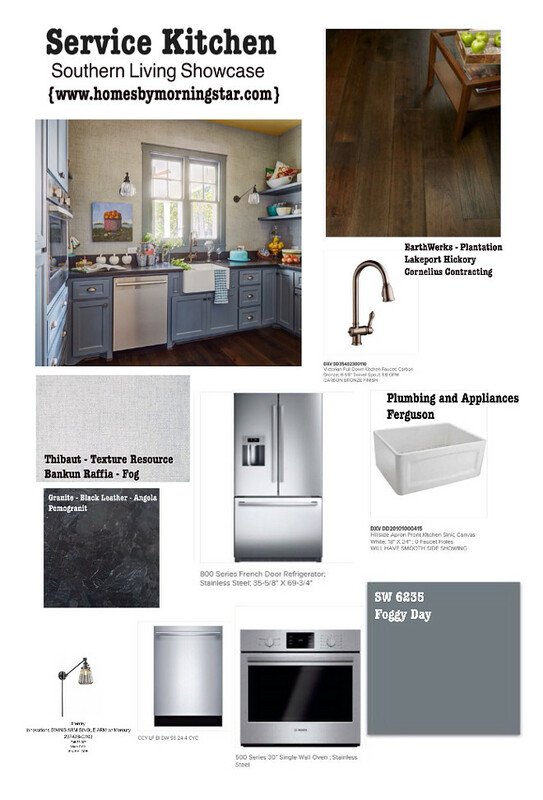 Cabinet paint color is “Sherwin Williams Foggy Day SW 6255”. Wallpaper: Thibaut Texture Resource Bankun Raffia Fog. This inviting room is located just off the foyer. 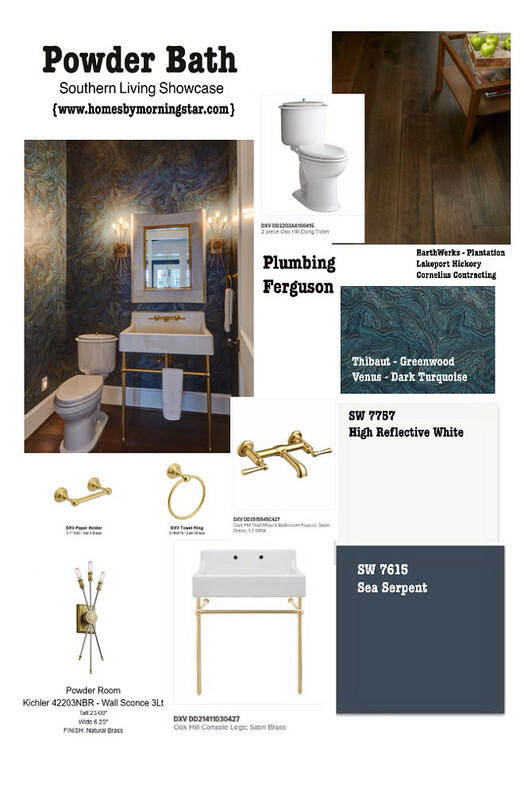 Paint color is Sherwin Williams SW 7615 Sea Serpent. 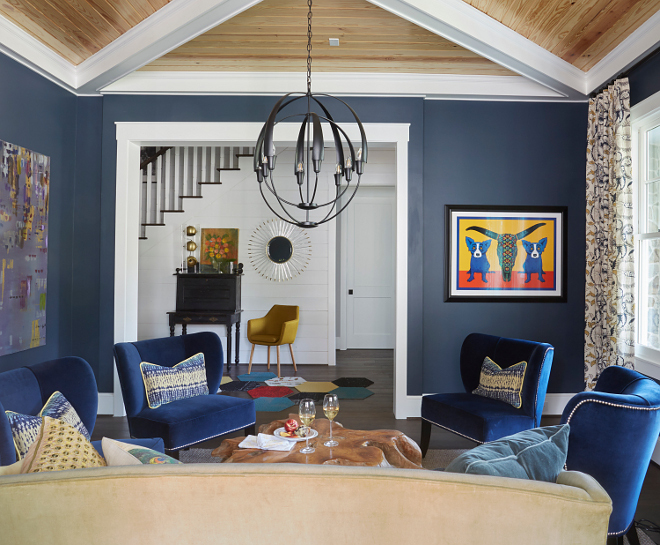 Lighting is Hubbardton Forge Double Cirque Chandelier. 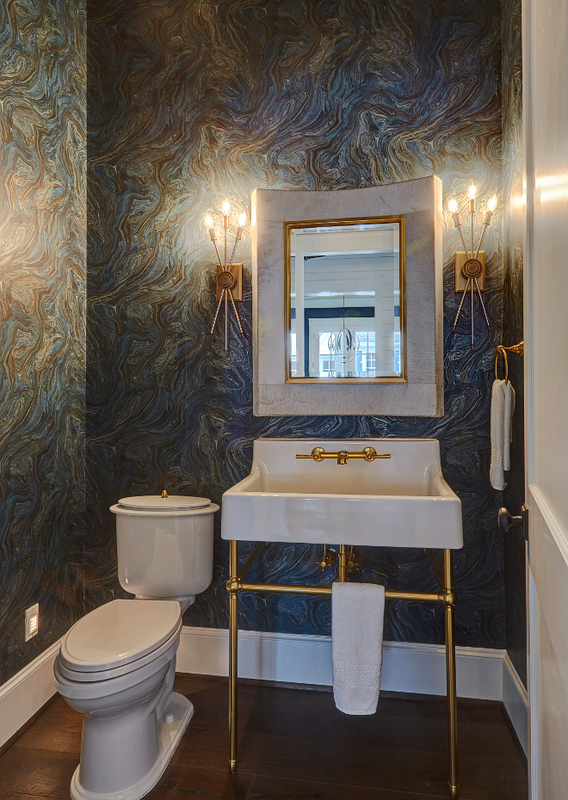 A moody wallpaper and brass accents bring a luxurious feel to this powder room. 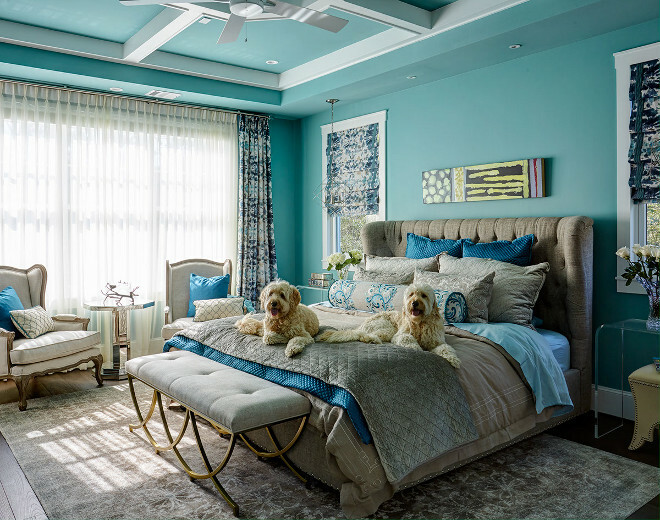 Wallpaper: Thibaut Greenwood Venus Dark Turquoise. Brass Console Sink: DXV DD21411030427 Oak Hill Console Legs. 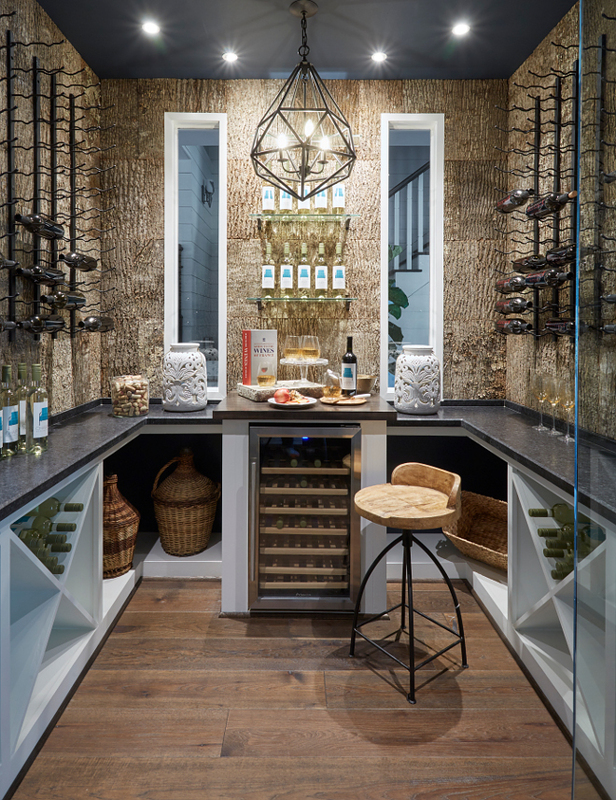 Gorgeous wine room with navy ceiling. 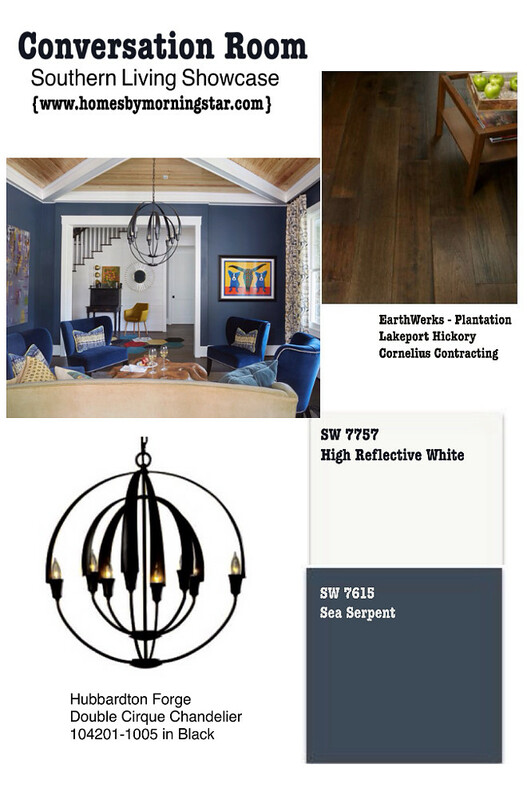 Navy ceiling paint color is “Sherwin Williams Sea Serpent SW 7615”. Lighting is Varaluz Facet Pendant. 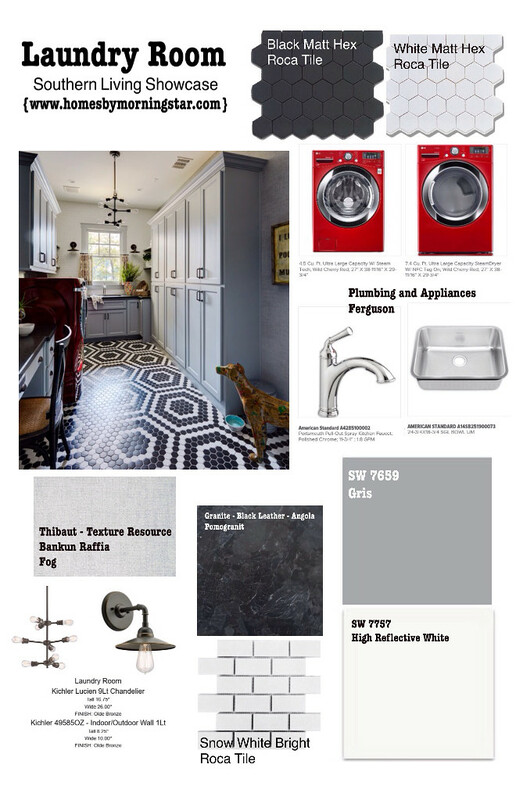 Sherwin Williams Grey Paint Color: “Sherwin Williams Gris SW 7659”. Lighting: Kichler Lucien 9Lt Chandelier. 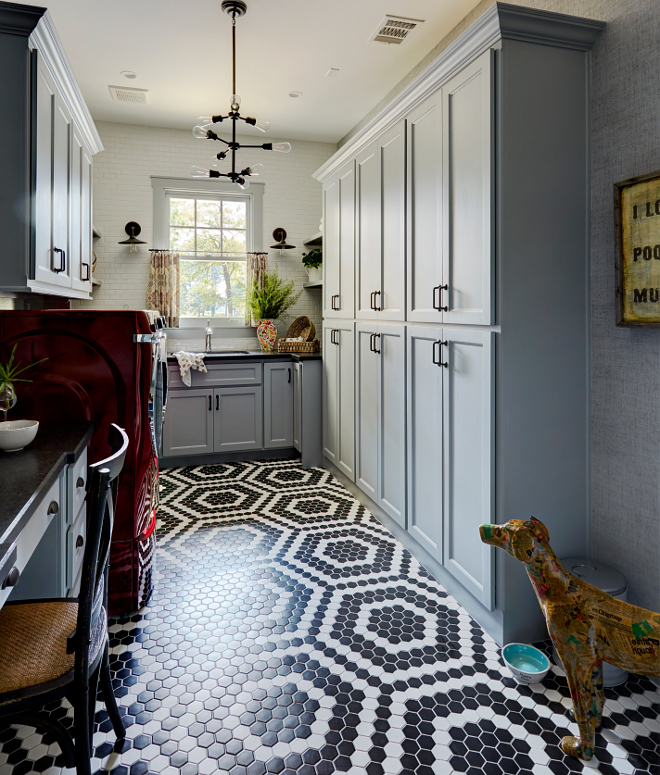 Flooring is a combination of black and white hex tile. 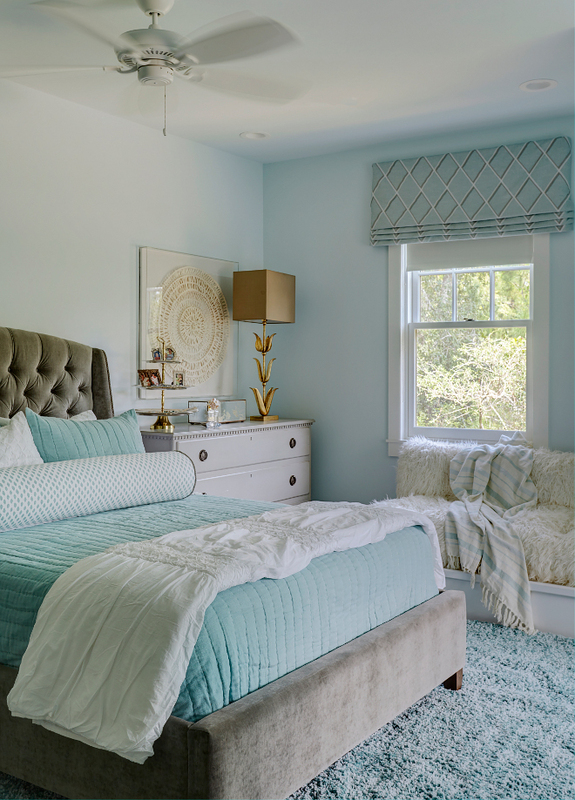 Light grey paint color by Sherwin Williams: “Sherwin Williams Passive SW 7064”. Ceiling Fan: Matthews Atlas Irene. Paint color is SW Passive. 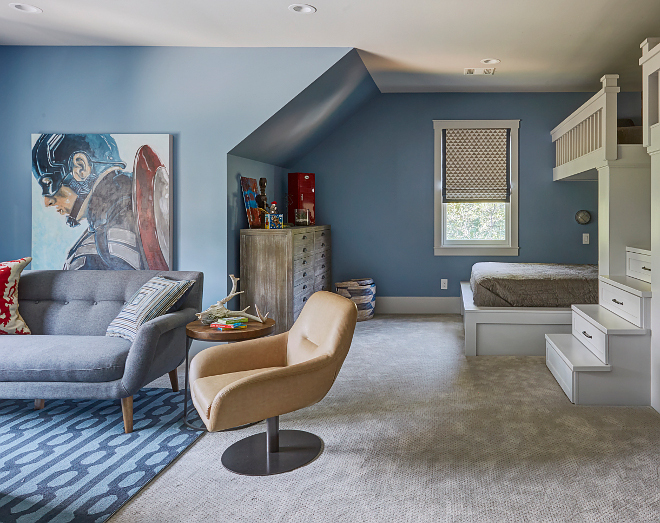 This girl’s bedroom features sloped ceiling, window-seat and built-ins. 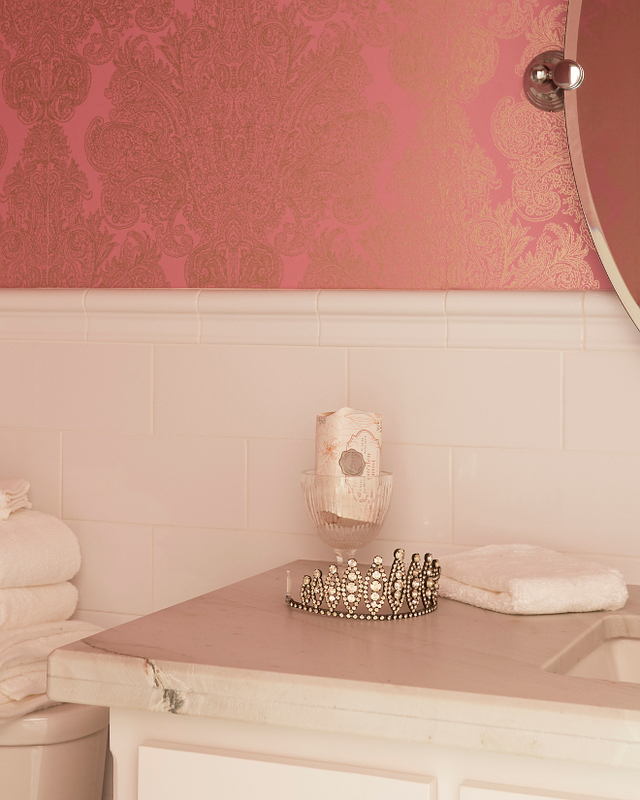 Light Pink Paint Color: “Sherwin Williams SW 6295 Demure”. Sink: American Standard Studio Undermount Sink. 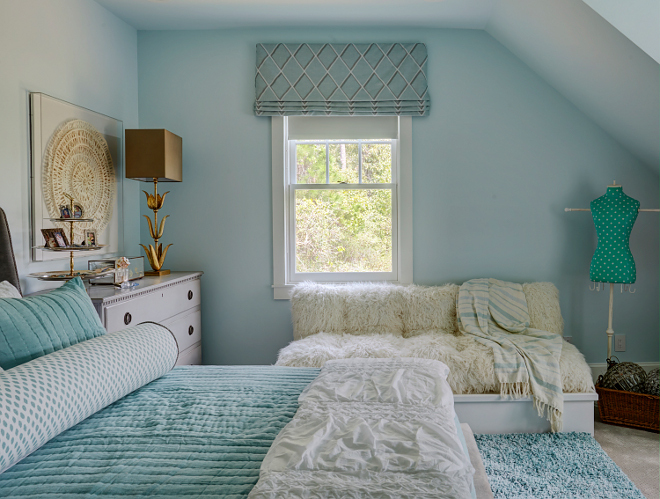 This bedroom is perfect for a teen girl. The color and decor are perfect! 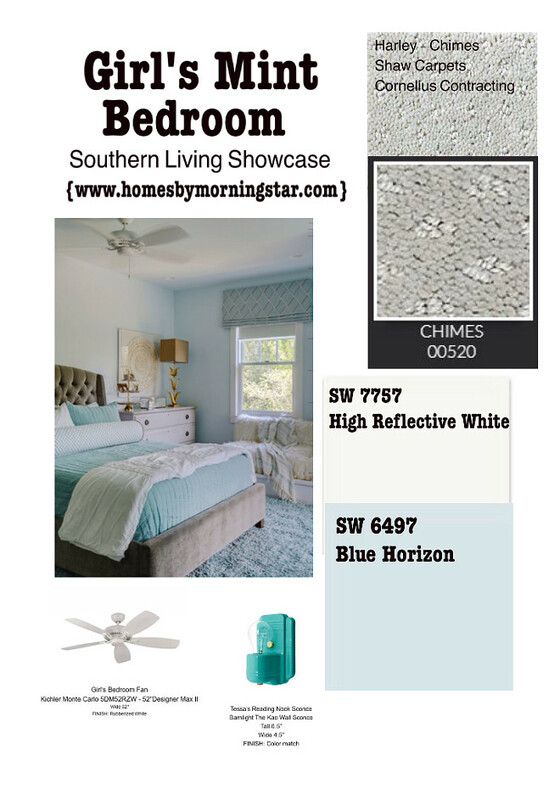 Paint color is “Sherwin Williams Blue Horizon SW 6497”. 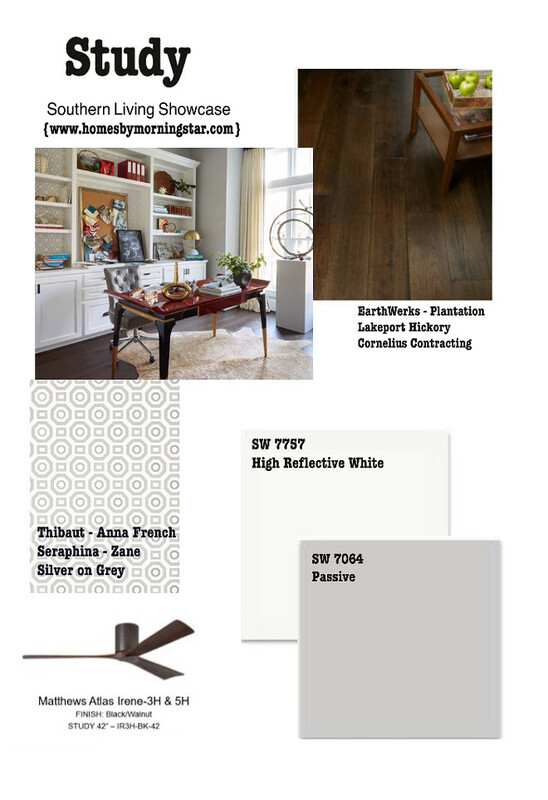 Ceiling fan is Kichler Monte Carlo. 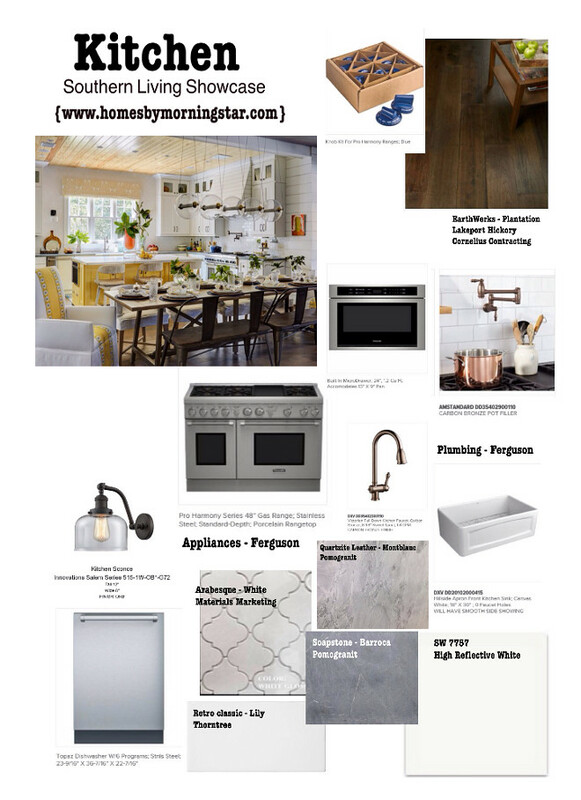 Countertop is Montblanc Quartzite – one of my favorites! Lighting: Starfire Radial Wave Reflector Wall Sconce | Barn Light Electric. 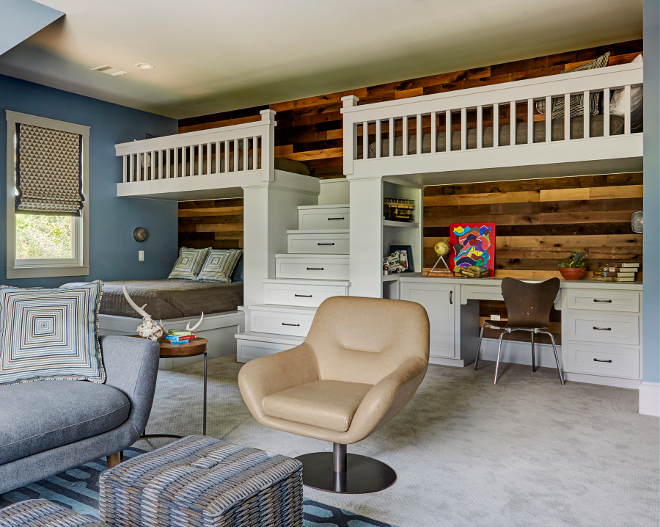 This fun bunk room features built-in bunk beds, desk area and reclaimed shiplap! 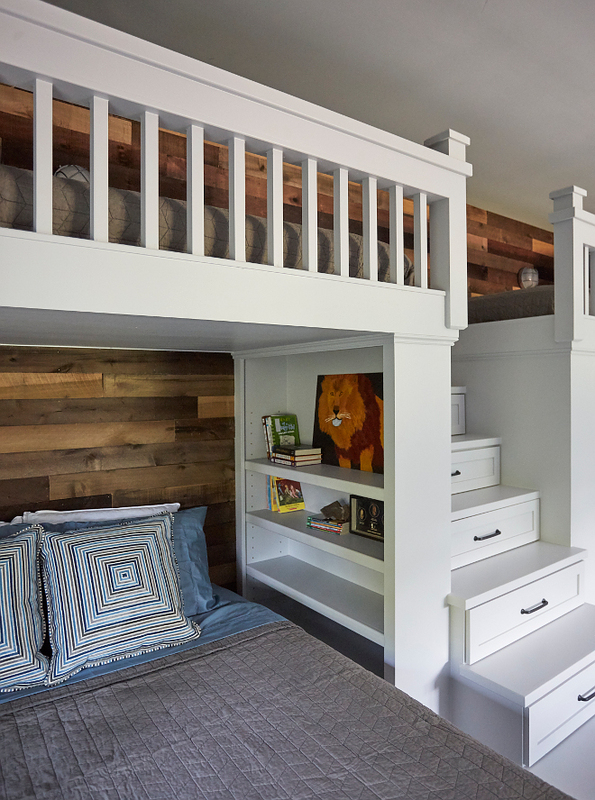 Bunk beds feature a built-in ladder with wide steps. 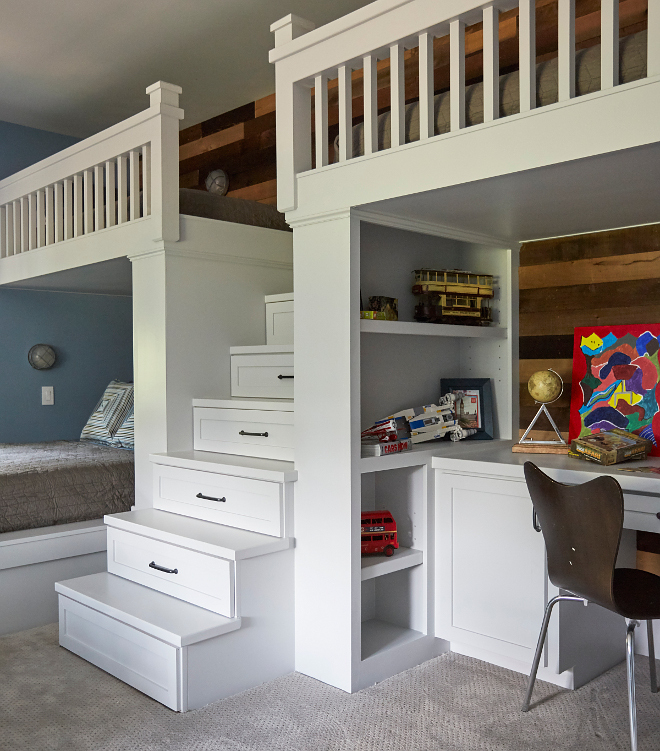 Creative built-in stairs with storage drawers. 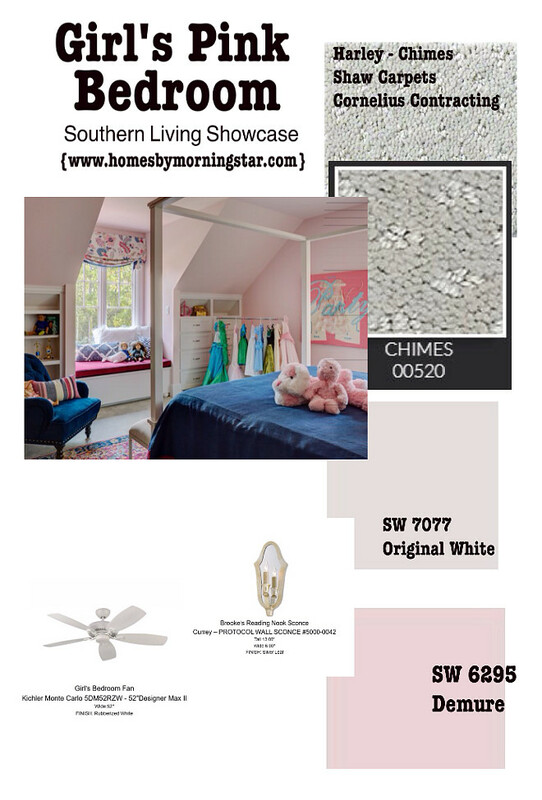 Paint Color: “Sherwin Williams Favorite Jeans SW 9147”. This boy’s bathroom is full of inspiration! 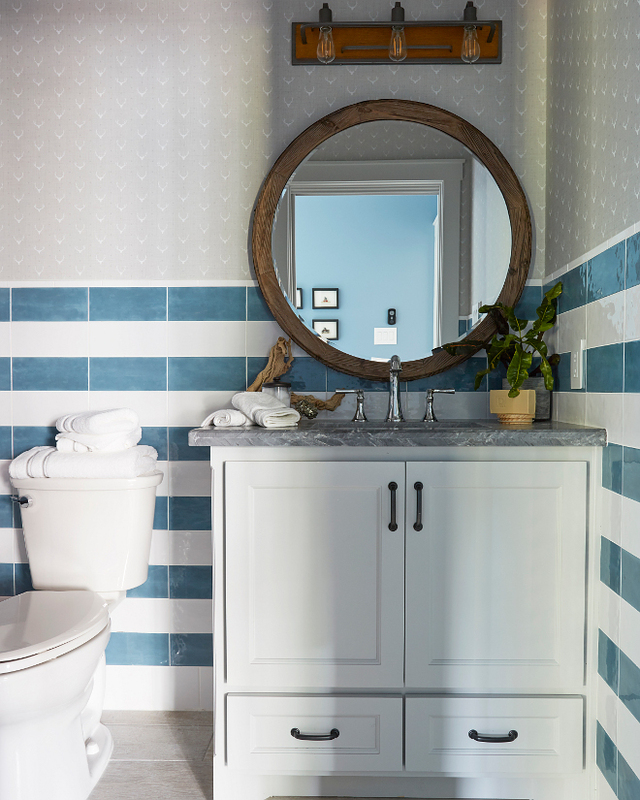 I am loving the blue and white striped tile wainscoting and the farmhouse elements. 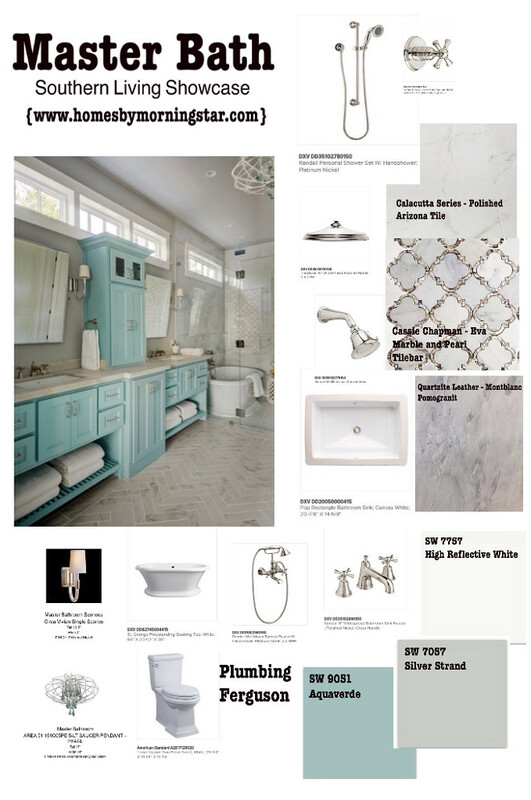 Blue Tile: Maiolica Roca Tile – 4×10 Blue Steel. 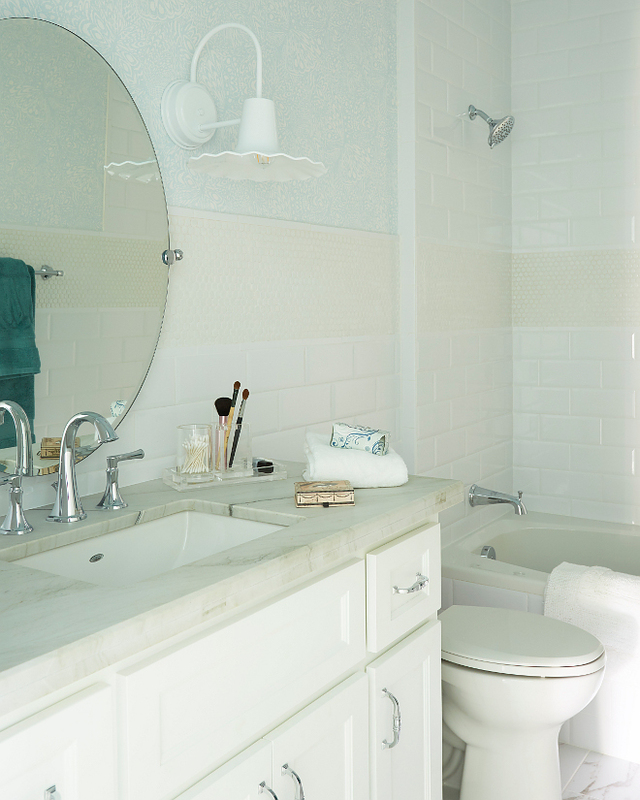 White Tile: Maiolica Roca Tile – 4×10 White. 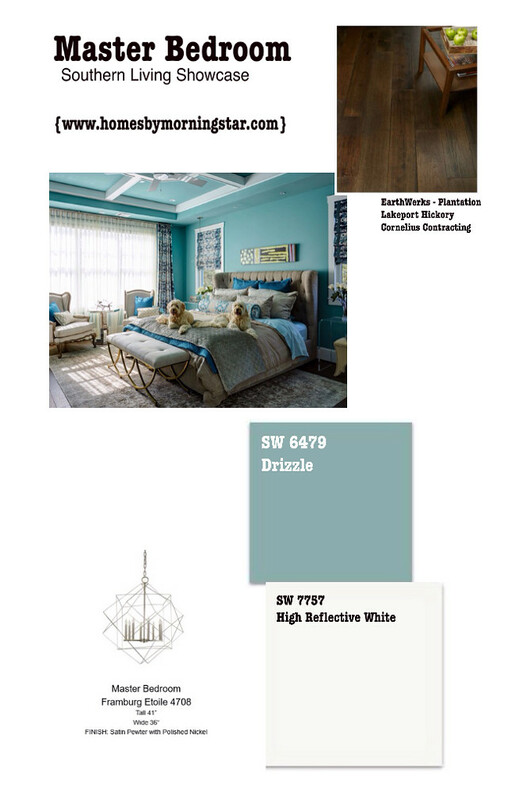 Paint Color is Sherwin Williams Drizzle SW 6479. 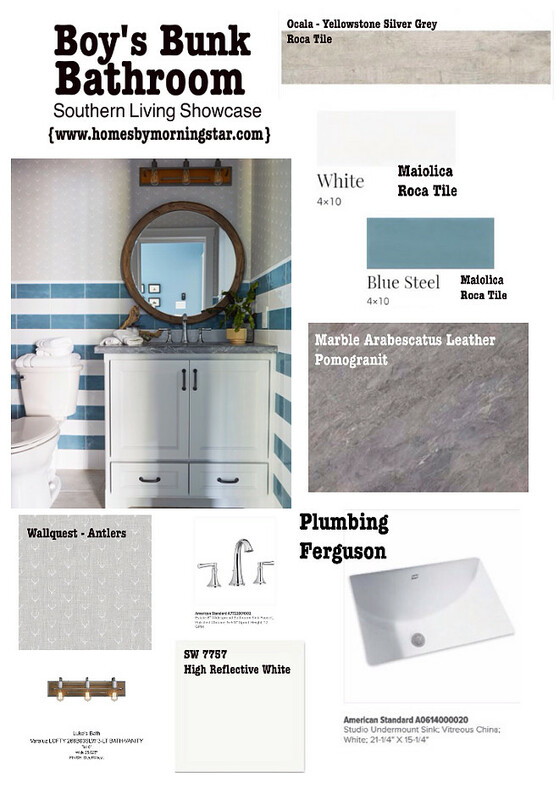 Cabinet Paint Color: “Sherwin Williams SW 9051 Aquaverde.” Wall color is “Sherwin Williams Silver Strand”. 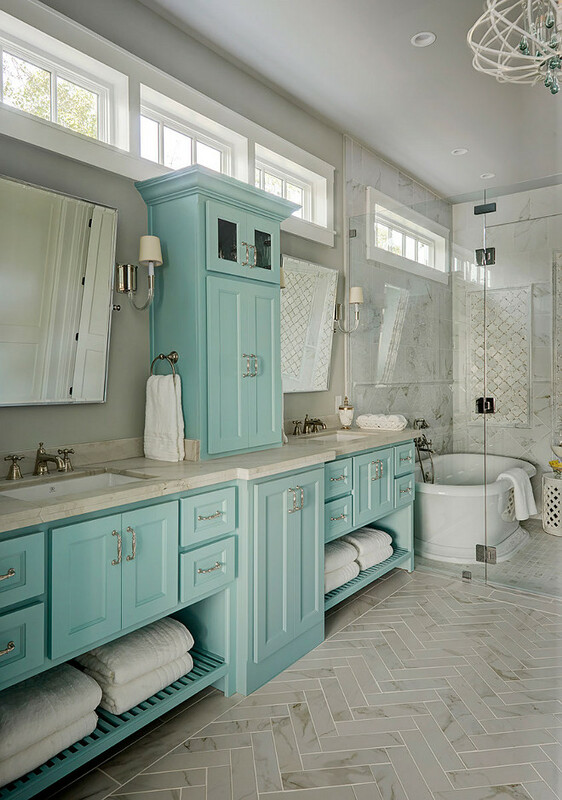 Floor tile is Calcutta marble by Arizona Tile. 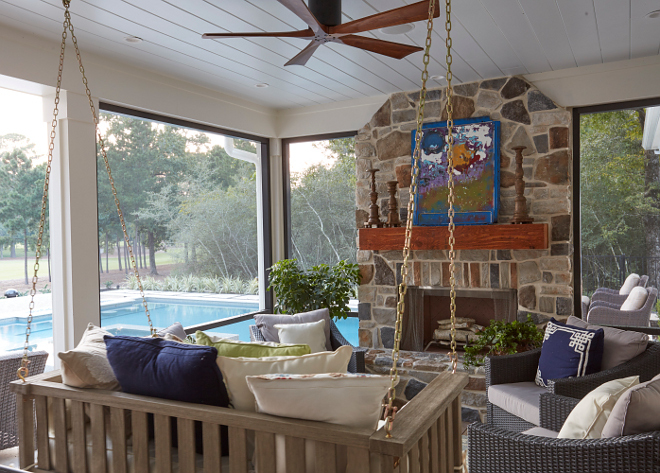 Screened-in back porch with swing facing the outdoor fireplace and view of pool and golf course. How dream is that?! Interior Design: Chairma Design Group. 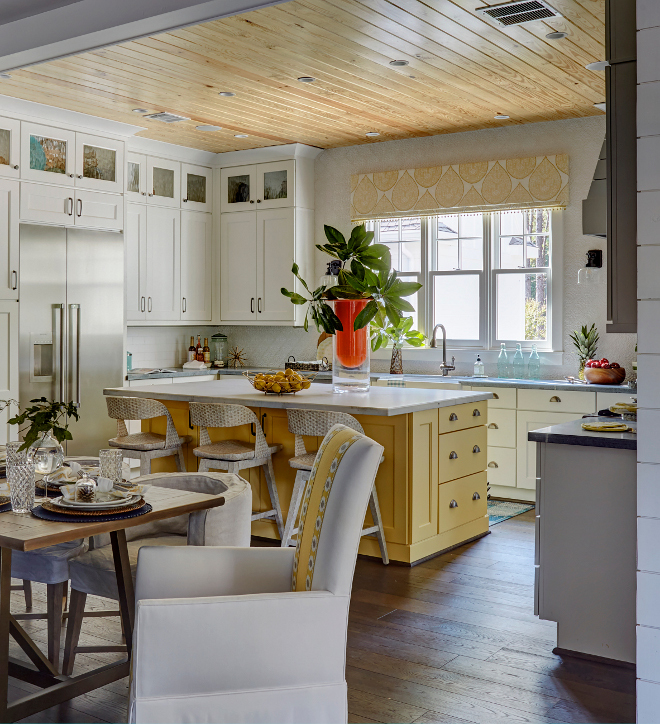 Transitional Modern Farmhouse Kitchen Design. How wonderful it is to have you here today!